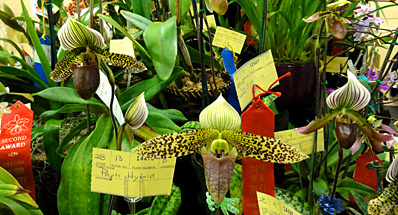 HUMIDITY is an elusive factor in orchid culture. For phalaenopsis, its influence can mean the difference between mediocre and superior plants and flowers. Growers of phalaenopsis under lights and in windows have to combat the natural tendency of indoor growing areas to be low in humidity. Without an almost continual replenishment of moisture in the air lost through heating and air conditioning, phalaenopsis may not thrive, though other factors in their culture may be adequate. 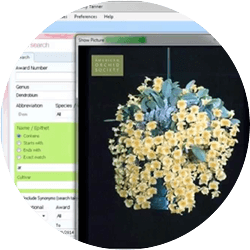 Humidity as the limiting factor in culture is nearly impossible to prove conclusively, and yet, for example, phalaenopsis sparsely arranged under lights and exposed to the dry air of a large, heated room will indeed suffer to some extent. Growing in very dry air, phalaenopsis may refuse to hold more than two or three flaccid leaves; whereas healthy phalaenopsis have at least four or five firm leaves at any one time. Plants attempting to flower under such conditions have been known to drop their buds. At the very least, those flowers which do open in dry air will not last nearly as long as those experiencing proper humidity levels. To increase humidity indoors, phalaenopsis growers need to provide a source of water open to the air, as well as to limit the volume of air to be moistened. Large trays filled with porous gravel on which the plants can be placed, maintained with a shallow pool of water, can yield adequate humidity, if they only have to moisten a limited volume of air. Closing the door to a small "growing room" may sufficiently limit the air volume. But during periods of stress on humidity levels, such as during cold weather when the heat is on frequently, these trays may not be enough to maintain the 50-60% relative humidity recommended for phalaenopsis (Hager, 1978; Freed, 1976). Humidifiers are more successful at increasing humidity indoors. Triggered by a humidistat, a humidifier will run when humidity levels have fallen below the desired, set level. Yet even humidifiers have limited capabilities, and for large, heated rooms they can end up running continuously, never achieving the desired humidity during peak periods of heating or cooling. Phalaenopsis growers with plants in larger rooms may find that only by enclosing the growing area in a tent of polyethylene plastic can enough humidity be maintained. Some form of air circulation is all the more necessary if this is done. Air movement can be brought about by a fan-driven humidifier aided by additional fans. Growers of phalaenopsis in basements may not have as much a problem with humidity, though the lower temperatures which in part make possible higher humidity levels can work against the phalaenopsis by slowing down growth. Beginners should be aware that humidity, like temperature, is to some degree a localized phenomenon. The plants themselves generate significant amounts of humidity through evaporation, both from their potting medium and their leaves. Because of this, a larger, more densely arranged collection of plants will be less susceptible to low ambient humidity than a small collection of widely spaced plants. Closely arranging phalaenopsis, unfortunately, has the disadvantage of reducing the air and light reaching each plant. Because phalaenopsis grow at a steady, constant rate throughout the year — given optimum light and temperature conditions — they need fairly consistent watering and fertilizing. This tendency to be in constant growth, in combination with their leafy plant habit lacking the water-storage capabilities of bulbous, sympodial orchids, gives phalaenopsis the reputation for requiring frequent watering. Watering frequency, however, is not solely determined by plant and growth habits. Low humidity will increase water loss through the leaves and potting medium, thereby increasing water requirements. Higher temperature and light conditions will have a similar effect, necessitating more frequent watering. 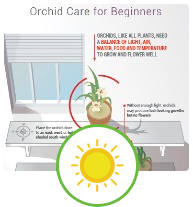 Conversely, low light and temperature conditions will greatly reduce the water (and fertilizer) needs of a phalaenopsis, as such conditions not only slow water loss but the growth rate as well. Pot size also greatly influences watering frequency. The larger the pot, the greater the reservoir of moisture surrounding the roots, and, consequently, the less often this water needs replenishing. For this reason, fully-grown phalaenopsis in 8-inch pots may only require weekly watering even under warm and bright conditions. Seedlings in 2- or 3-inch pots, on the other hand, are likely to need repeated waterings during any one week in order to maintain adequate moisture at their roots. Determining the amount of moisture in the pot at any one time is essential in deciding whether to water. 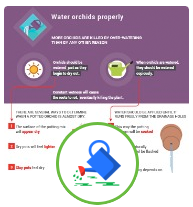 As suggested with paphiopediiums, lifting the plant in question is one of the best ways to determine the moisture conditions in the relevant interior of a pot. With practice, a grower can sense immediately when additional water is needed by the relative light weight of a plant in-pot. Deciding how often to fertilize phalaenopsis can be a greater challenge for the beginner. The needs of any plant for the nutrients provided by fertilizers are, like humidity requirements, very difficult to determine precisely. One factor to consider is the growth rate of the plants. Not all phalaenopsis grow at the same rate. Phalaenopsis seedlings can be very fast growing, and therefore may need more frequent fertilizing than older, more slowly growing plants. Phalaenopsis experiencing cool temperatures during the winter months may grow so slowly as to require little additional nutrients until night and day temperatures increase and significant growth resumes. With the growth rate in mind, it is usually recommended that phalaenopsis be given fertilizer every one to two weeks in the summer and every three weeks to monthly during the winter (Freed, 1976; Noble, 1971). Poole and Seeley (1977), in their scientific studies of phalaenopsis seedlings under artificial light, found that a slow-release fertilizer, providing low levels of nutrient with every watering, produced the best results. Hager (1978) cautions all phalaenopsis growers, however, to make sure the potting medium is moist before fertilizing, as phalaenopsis roots are especially sensitive and will burn at the tips if exposed to salt concentrations. This susceptibility to damage from salts is one reason why it is generally recommended that fertilizer be applied to phalaenopsis only in the form of a dilute solution. Water-soluble fertilizers, themselves mixtures of nutrient salts, dissolve readily when water is added. Used at the commonly recommended dilution rate of 1/2 teaspoon of fertilizer per gallon of water, inorganic water-soluble fertilizers such as the 30-10-10 and 20-20-20 formulas are safe and beneficial. Organic fertilizers such as fish emulsion (with a 5-5-1 formula) are also widely used for phalacnopsis. 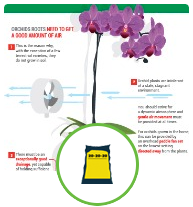 Other facts support the recommendation that phalaenopsis be given only light applications of fertilizer when in growth. Even the most rapidly growing phalaenopsis seedlings, when compared to other, non-orchidaceous plants such as annuals, cannot be considered "fast-growing" in a broad sense. The occasional new leaf and gradually lengthening roots of mature phalaenopsis in growth would surely characterize them as the "snails" of the horticultural world. Slow-growing plants such as phalaenopsis simply do not require great quantities of fertilizer. Also not to be disregarded in forming fertilizing practices for phalacnopsis is the potting medium. The epiphytic media used for phalaenopsis are very porous and coarse when compared to the soil-like mixes used for other, more conventional houseplants. Consequently, after the fertilizer solution runs through the potting medium and out of the pot, little fertilizer can be expected to remain behind. The plant gains the greatest benefit through direct absorption of nutrients from the solution applied, when it is applied. For this reason, frequent but light fertilizing is thought to be advantageous. Many large-scale commercial and private phalaenopsis growers apply extremely dilute fertilizer solutions every time they water by means of fairly elaborate proportioners attached to their water sources. Without the flushing, or leaching action of plain water applied between successive fertilizer applications, though, a greater chance of damaging salt accumulation in the potting medium exists. Growers with small collections of phalaenopsis, and without precise proportioners, might be well advised to limit their frequency of fertilizing to "every other watering" — at most. In this way,the substitution of a dilute fertilizer solution will be both preceded and followed by a simple watering. The type of potting medium used has a strong effect on the fertilizer and water needs of a phalaenopsis. Potting media vary in their capacity to retain water and nutrients. 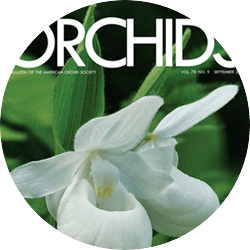 Osmunda, prevalent in orchid culture before the 1960's, is capable of retaining large amounts of water, as well as providing nutrients of its own. Therefore, plants in osmunda required less frequent watering, and infrequent fertilizing — if at all. Osmunda is in virtually non-existant as a potting medium today due to the limited quantities available and its high cost. Today, fir bark, tree fern and sphagnum moss are the most commonly used potting media for phalaenopsis. With the exception of sphagnum moss, they are far less capable of retaining water and nutrients than osmunda, but vary considerably in these capabilities depending on the stage of their decay. Fir bark is a very dynamic potting medium. At first, bark goes through a stage of rapid drying, even if wetted before use in repotting. Usually within a month after repotting, the bark becomes "seasoned", or thoroughly moistened. Once this is achieved, organic decay of the bark begins in earnest, with the proliferation of decay microorganisms which themselves require nutrients, particularly nitrogen. This decay continues, and generally within two years the bark is reduced to fine-particled humus, a decay-resistant material capable of retaining large amounts of water and nutrients. Because of this on-going decay process, phalaenopsis potted in bark and tree fern will vary in their water and fertilizer requirements, depending on when they were last repotted. Recently repotted plants are likely to need more frequent watering and fertilizing than those which have been repotted for a year or more. A high-nitrogen, water-soluble fertilizer, such as the 30-10-10 formula, is generally used for phalaenopsis in mixes containing bark in order to compensate for the decay organisms' demand for nitrogen although a mounting body of evidence suggests that such high nitrogen fertilizers do more to accelerate the decomposition process than they do for improved growing of the plant and lower nitrogen concentration might be a better choice. Usually by the second year after repotting, decay will have enhanced the capacity of an organic mix to retain water and fertilizer, and will have itself slowed down, thereby reducing the frequency of watering and fertilizing necessary. Figure 1 A dying back of visible roots and the raised position of the root system above the pot are indications that this phalaenopsis needs repotting. All Photography: Stephen R. Batchelor. Choosing the proper potting medium for phalaenopsis is perhaps a matter of trial and error. The best choices, however, are made after considering the characteristics of the plant, the grower, as well as the potting medium. Phalaenopsis are sometimes potted in fine-grade materials because of their high requirement for moisture. A fine-grade mix does dry more slowly, being less porous. But this reduced porosity has a significant drawback in that it greatly reduces the oxygen level of the mix — particularly when it is wet, all the more so when it has begun to decompose. Roots cannot function without adequate oxygen, and phalaenopsis roots especially seem to require excellent aeration. Phalaenopsis potted in dense media often produce roots which refuse to penetrate the mix, moving instead along the surface and over the side of the pot. With the majority of their roots outside the potting medium and pot, such plants are unduly exposed to humidity fluctuations. At the very least, they are awkward to water and fertilize. Many successful phalaenopsis growers use medium- and even coarse-grade potting media for all but their smallest seedlings, and community pots. Ralph and Chicko Collins, who have a well-deserved reputation in the Northeast for being superb phalaenopsis growers, use a mixture of 50% tree fern and 50% fir bark for their large collection. They use medium-grades of these two common materials for plants in 3- and 4-inch pots, coarse-grades for plants in 6-inch pots, and some "chunk"-grade material for plants in 8-inch pots. With these more porous mixtures, watering in their warm and humid greenhouse is required once a week for the larger plants. The Collins' exclusive use of nonporous, plastic pots helps avoid rapid drying. Figure 2 Unpotting the plant reveals a potting medium which is largely decomposed. The roots along the periphery are in good condition, while those toward the interior of the mix are brown and decaying. Beginners may want to follow this example, particularly if they are inclined to water and fertilize frequently, like so many of us. The porosity of a medium-grade tree fern and bark mix makes airless conditions at the roots unlikely, even just after watering, and encourages root growth. Coarse-grade materials, however, might be avoided for all but the largest pots and plants, if the prevailing humidity is low. Such high porosity could overexpose the roots to drying under these stressful conditions. For this reason, also, porous clay pots should be excluded from use in growing phalacnopsis indoors. Whatever the grade of materials when first used, the final decay of an organic potting medium makes repotting necessary, as the humus resulting lacks sufficient aeration for survival of phalaenopsis roots. Yet there are other reasons for repotting phalaenopsis. While these monopodials do not grow over the edge of the pot as many sympodial orchids do, they do grow taller to the point that the region of the stem with the most active roots is above and out of the potting medium. Either of the two reasons mentioned here would justify the repotting of the phalaenopsis pictured in FIGURE 1. Figure 3 Cleaned of potting medium and decayed roots, this phalaenopsis has been divided along the stem into two divisions - a leafy top section (right) and a leafless base section (left). How has the author erred in his treatment of this latter division? Phalaenopsis roots are very often an accurate indication of whether repotting is necessary. The dying back of visible roots is a good indication at a glance that the plant is suffering (FIGURE 1). Only by unpotting the plant in question, though, can both the condition of the entire root system and the potting medium be determined (FIGURE 2). The bark mix pictured in FIGURE 2 has been reduced to humus, and the airless conditions present in the interior of the mix have led to the death of the roots once growing there. This lack of aeration towards the interior of the mix could also explain the tendency of newer, still active roots to congregate along the inner-surfaces of the pot. Live phalaenopsis roots are light in appearance, whereas dead roots quickly become dark and brown (FIGURE 2). This easy distinction is very useful in the repotting process. After the plant has been unpotted, and the decision to repot has been made, the plant should be cleaned of both decaying potting medium and decaying roots (FIGURE 3). Once this has been done, a suitable pot can be chosen which accommodates the root system comfortably (FIGURE 4). Mature phalaenopsis often need larger, 6-inch and even 8-inch pots because their root systems tend to be large, long and rather inflexible. After the appropriate pot has been selected, many growers add a bottom layer of gravel to enhance drainage (FIGURE 4). With the plant properly positioned in the pot, such that the portion of the stem bearing the roots is below the rim (FIGURE 4), the premixed medium is added and gently pressed in and around the roots (FIGURE 5). Figure 4 Four-inch plastic pots, with a layer of gravel in the bottom for drainage, are large enough to fit the root systems comfortably. Phalaenopsis, like many monopodials, can be divided along the vertical stem as one means of propagation. This can be done once the stem has achieved sufficient length as to allow each of the resulting divisions to have adequate root systems. FIGURE 3 illustrates this point, but at the same time is, unfortunately, misleading, as are the following FIGURES 4 and 5. Unwittingly, the photographer in the author got the better of the grower! There is no question that the tip-cutting (top portion) of such a monopodial division requires repotting. Once cut and removed, it needs a pot of its own. But, not only is the repotting of the remaining base portion, illustrated here, not necessary, no experienced phalacnopsis grower would recommend it! Figure 5 A medium-grade mixture of 50% bark and 50% tree-fern is added and pressed snugly around the roots. Proper tagging maintains the identity of the cultivar. A tip-cutting of a phalaenopsis, with a healthy complement of leaves and roots, usually continues to grow without relapse. It requires no special care, other than perhaps additional protection from extremes of light and temperature. The base section resulting from the division of a phalaenopsis, on the other hand, requires quite a different treatment. Without leaves and an active growing point, and without the ability to manufacture food, it is in a precarious state. A base division of a phalaenopsis must draw on what stored energy it has to initiate one of the dormant nodes on the side of its stem and resume growth. The last thing a grower should do is to further shock a base division by repotting! Figure 6 Some time after the top was removed from this base division, an offshoot has formed, developing its own root system independent of that of the original division, now decayed. Even in the case of the plant pictured, where the potting medium is largely decomposed, the base division is best left as undisturbed as possible. Further decomposition of the root system is unlikely, if water is all but withheld. The water requirements of a leafless stem and root system are minimal. Placing such a base division out of direct light, as recommended, further reduces the need for additional water. Water should only be given when some desiccation of the division is apparent (Freed, 1976). Under proper conditions, there is a good chance that within several months a dormant node will activate, producing an offshoot. Once the offshoot produces several leaves, and roots a few inches long, it can be removed from the stem, potted separately and placed in a protected location in the growing area. The rooted base section of a phalaenopsis division, in this way, is used only as a vehicle for producing one or more, new plants. It never again becomes the main support for a leafy top-portion. Even when the offshoot produced is mistakenly not removed, it grows its own root system which supplants that of the base division (FIGURE 6). In any event, the base division eventually declines and dies. But it is far more likely to do so, quickly — and without producing a new plant — if it is repotted! Other, more prolific and dependable means of propagating phalaenopsis can be employed by the grower. 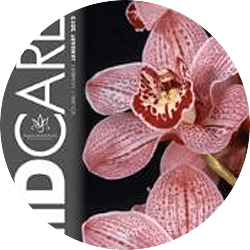 Next month's concluding article will continue this discussion of propagation, and will devote some attention to the problems commonly encountered in growing phalaenopsis. Freed, Hugo. 1976. Phalaenopsis are Easy to Grow. Amer. 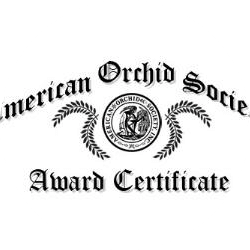 Orchid Soc. Bull. 45(5): 405. Hager, Herb. 1978. ABC of Phalaenopsis Growing. Amer. Orchid Soc. Bull. 47(12): 1096. Noble, Mary. 1971. You Can Grow Phalaenopsis Orchids. Privately published. Poole, Hugh A. and John G. Seeley. 1977. Effects of Artificial Light Sources, Intensity, Watering Frequency and Fertilization Practices on Growth of Cattleya, Cymbidium and Phalaenopsis. Orchids. Amer. Orchid Soc. Bull 46(10): 923.